Leave a Man, Come back a Hero... from SPACE. Axe, makers of body spray and other personal hygiene products created by Unilever, offers a chance to fly 22 people one at a time, into space on a X-COR Lynx sub-orbital space vehicle. The 22 winners will be selected during the AXE Global Space Camp in Orlando, Florida which features exciting space-simulation challenges. This tasks include high speed jets that will flip you around, parabolic flights that will get you weightless, and a centrifuge that will crush you with either centripetal or centrifugal force. X-COR Lynx is designed to fly two people — one pilot and a passenger — to an altitude of 62 miles (100 kilometers) during suborbital flight. 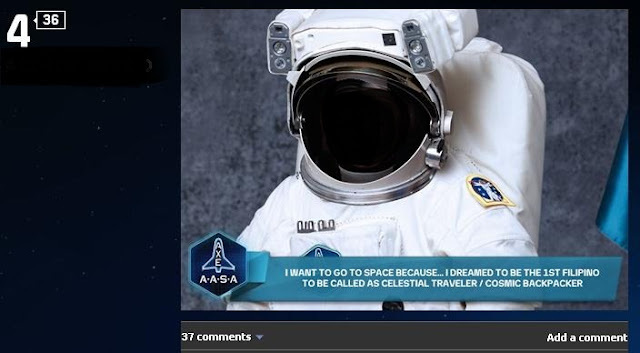 As a self-confessed travel addict, one of the most remarkable achievement for likeminded people is to travel to space. After the campaign above kicked-off last January 2013, I signed-up for a profile representing State of Kuwait, I am a legitimate resident and worker on this country. The major instruction is to make a profile explaining why you should want to go to space — and then get everyone to vote on you. If you make it into the top tier, you do a country-specific “challenge” to determine a national champ. The top recruit will advance to the next stage of the process going to Florida. August 29, 2013, I received an email from Unilever stating that I'm so close on making my dream come true! They asked me for my mobile number, passport and residence copy. By extra-ordinary surprise sudden reaction and to my very heart-pounding feeling, I asked 1st if this email was spam or not, and even inform immediately my fellow co-workers after I read it. This was because what the hell did I do to represent my present location and be part of 2013's most talk-about real-life very, very expensive travel adventure. September 05, 2013, I received an email invitation letter for the Axe Apollo Space Academy (AASA) Middle East region with general information about the program. 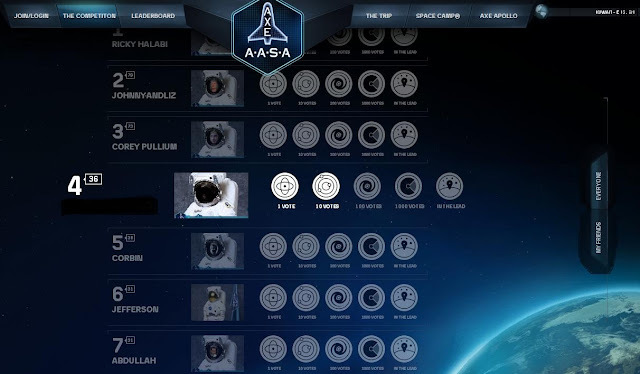 I've been selected to take part in the AASA Grand Finale where 8 contestants from the region will vie for a chance to fly to outer space. Included in the email was the notification of an all-expense paid trip to Dubai City, United Arab Emirates. Just bring at least 150 dirhams for visa-on-arrival fee (reimbursed once meet but visa-on-arrival cost now at 185AED=$50) and the round trip e-ticket for 2-days in Dubai with breakfast and lunch included. In addition, there will be a pickup from the airport to Media Rotana Hotel for one night stay. Maybe it was meant also for me to attend this event despite of having a 50/50 gut feeling due I feel guilty to file a surprise 2 days-off on my work. Good thing the Officer-In-Charge is a very understanding Filipino, even though I have some pending assignments he still managed to allow me. Even the exit permit and the approval on the Manager's desk has been done in just around 40 minutes before I left the office hours to go on departure. Just for everybody's information, I received the Axe Apollo email confirmation the night of September 05 (5-days before the event) which by the way I'm on my way going to airport outbound to my home country for a very short weekend trip with vacation leave applied. So requesting again for another days-off immediately after I went back to my country of work was already an extreme privileged for a suffering corporate slave travel addict like me. The Axe Apollo Space Academy (AASA) Challenge will be held on September 10, 2013 Tuesday night at the Royal Ballroom, Royal Mirage, One & Only. Participants have to leave the Media Rotana hotel at 1630H and must arrive on 1700H sharp in Royal Ballroom to facilitate briefing and details of the whole program. Axe Apollo Middle East Grand Finale, there can only be two!